As soon as I saw this recipe from Pink Parsley pop up, I knew I wanted to make it. 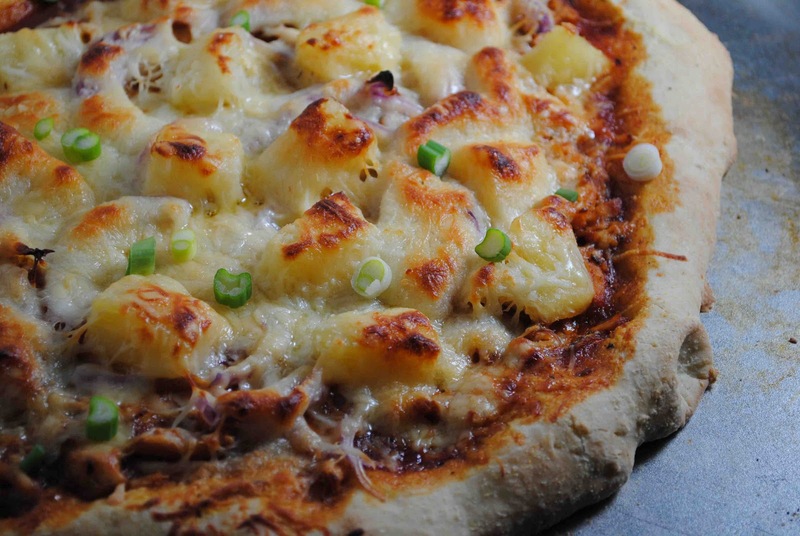 We love to make our own pizza, and quite honestly, it's been far too long since the last time we did. The combination of ingredients on this pizza is something I wouldn't have thought of on my own, but so glad that I tried. Next time we have leftover pulled pork, I know what I'll be doing with it! Place a pizza stone in the oven and preheat to 500 degrees for at least 30 minutes. On a large square of parchment paper, stretch and roll the pizza dough into a 12-14 inch circle. Brush the outer edge with olive oil. 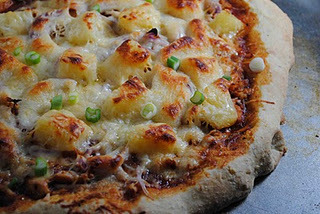 Spread the BBQ sauce over the dough, then layer the pork, onion, and pineapple. Sprinkle the cheese evenly over the top. Transfer the pizza to the heated pizza stone and bake for 10-12 minutes, or until the crust is golden-brown and the cheese is melted. Sprinkle the scallions over the top. Allow the pizza to cool for 5-10 minutes, then slice and serve. To make the dough by hand, combine half of the flour with the yeast and salt in a bowl and stir to blend. Add the water and olive oil; stir with a wooden spoon until smooth. Add the remaining flour a bit at a time. When the mixture becomes too stiff to stir with a spoon, begin kneading it in the bowl of a stand mixer fitted with the dough hook attachment, adding as little of the flour as possible-just enough to keep the dough from being a sticky mess. Knead for 5-10 minutes. Turn the dough out onto a floured work surface and knead for a few seconds to form a smooth, round ball. Transfer to a bowl and cover with plastic wrap. Let rise until doubled in size, 1-2 hours. (You can cut the rising time if you are in a hurry, or-preferably-you can let the dough rise more slowly in the fridge for 6-8 hours. The dough can then be used immediately or wrapped tightly in plastic wrap and frozen for up to 1 month. Defrost in a covered bowl in the fridge or at room temperature.) Form the dough into a ball and divide into 2 pieces, roll each piece into a ball. Place on a lightly floured surface, sprinkle with a little flour, and cover with plastic wrap or a towel. Let rest until slightly puffed, about 20 minutes. Oil one or more baking sheets, as needed, then press each dough ball into a flat round directly on the sheet. Pat out the dough as thin as you like, using oiled hands if necessary. Proceed with pizza recipe.